I was trying to install VMware-UpdateManager-Pscli-4.0.0-233997.exe after downloading the new version: VMware-UpdateManager-Pscli-4.1.0-266648.exe I was able to install the vCenter Update Manager cmdlets again. 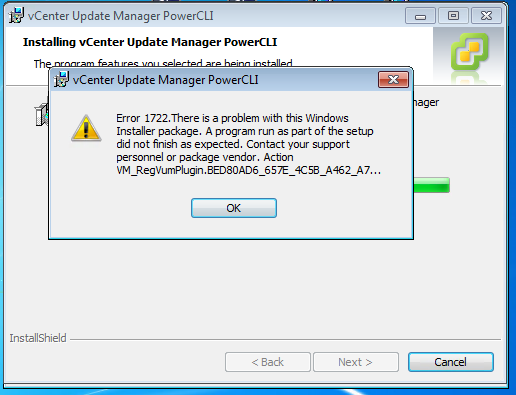 So if you’re running Windows 7 and want to use the vCenter Update Manager PowerCLI cmdlets, just install the latest version and you don’t get the this error. This entry was posted in Automation and tagged PowerCLI, vCenter Update Manager, Windows Installer on January 11, 2011 by afokkema.